New designed for golfers seeking exceptional soft feel and low spin for long, straight distance . 1. High performance thinner elastic surlyn blended cover technology. 2. Large fast reaction core. 3. Stylish dual-radius multi-dimple design. New designed to optimize performance for players seeking a combination of distance plus drop-and-stop performance. 1. Extra large energy-charged inner core formulation benefits superior velocity. 2. Soft thermoplastic elastomer second layer. 3. Soft elastic Surlyn blended cover for bigger spin, drop-and-stop performance around the greens. 4. Aerodynamic dual-radius multi-dimple pattern design minimizes drag, prolongs lift and extends flying. 4-P golf ball is the first perfect dual core and double cover design, engineered for longer distance. 1. Extra large energy-charged dual core formulation benefits superior velocity. 2. Soft TPE elastomer second layer allows maximum deformation after impact. 3. New Evolutional Ionomer Cover for good scuff, provide soft touch feeling. 4. Aerodynamic dual-radius multi-dimple pattern design minimizes drag, prolongs lift and extends flying distance with a middle and favorite straight trajectory. 5. Super Paint for slipproof, grab the club surface well and enhance control. Surlyn blend cover 2-piece range ball, superior cut-resistant and durability with high performance as a tournament ball. US Dollar, Yen, Euro Dollar, Pound, HKD etc.. 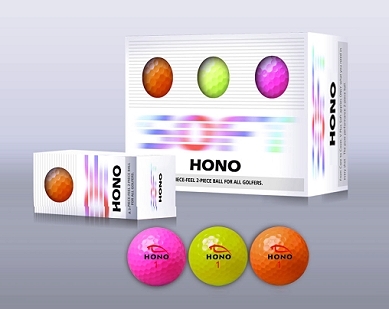 Golf Ball Manufacturer & Export-HONO GOLF B2B in Taiwan-Currency Ball,3-Piece Titanium Tournament Balls,2-Piece Titanium Tournament Balls,1-Piece Range Ball,2-Piece Range Ball,Currency Balls,golf balls,golf gift ball,golf range balls,golf gift balls,Titanium Course ball,Titanium Course balls,Golf balls Manufacturer,Golf balls Export,Golf balls Supplier. New Design for 2005: Automatic Golf Ball Dispensing machine.